A major priority of ours has been to support March Forward!, an ANSWER-affiliated organization of anti-war veterans, active-duty soldiers and marines. When Israel, with U.S. support, renewed its assault on Gaza, ANSWER mobilized immediately. In October, ANSWER joined with many others to call for an end to the war in Afghanistan. We link the struggles against war and imperialism abroad with the anti-racist and other progressive struggles at home. ANSWER has been proud to stand with workers fighting back, in these heroic stirrings of revitalization from the U.S. labor movement. This year, young women activists with ANSWER launched a new women’s rights organization, WORD, dedicated to in-the-streets protest. A global grassroots movement for change is shaking the political foundation of a social order based on militarism, war, occupation, repression and severe economic equality. We are asking for your urgently needed tax-deductible donation to continue our work. Donors who give $50 or more by Dec. 31 will receive a copy of Richard Becker's "Palestine, Israel and the U.S. Empire," and all gifts will be matched dollar-for-dollar up to a total of $5,000 thanks to a generous offer by activist and educator Jane Cutter. From the Middle East to Latin America and from the streets of Athens, Madrid, and Rome to New York and Madison, Wisconsin – a new generation has initiated the next phase in a global struggle that demands justice. In this movement lies the hope of the future. Against these forces for progress stands the Pentagon, CIA and the networks of elites and reactionaries who are the beneficiaries of the old order. The last few years have shown that we need more than new politicians. We need a powerful grassroots people’s movement that can fightback against war and injustice. Eleven years after our founding, the ANSWER Coalition has grown to be a national fighting force led by the next generation of young organizers committed to creating a just society. 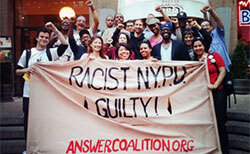 The ANSWER Coalition has active chapters in more than twenty-five cities, planning, organizing and hitting the streets. ANSWER offices are a hub of constant activity, coalition-building and outreach to neighborhoods, community groups, schools and workplaces. The ANSWER Coalition and the thousands of volunteers and activists who carry out the work for justice and peace are in this struggle for the long haul. These are exciting and challenging times. What each of us does, however big or small, can help the global movement for change grow. We are not tinkering around the edges but confronting war, racism and injustice head on. The ANSWER Coalition is about action and the mobilization of the people. In the fight for justice, we connect the struggle against racism and repression at home with our opposition to war and occupation abroad. We are unwilling to step back or be intimidated. As many of you know the government has targeted ANSWER with massive fines for publishing anti-war posters. When we were hit with these outrageous fines, we said that we wouldn’t pay a penny to the government seeking to threaten bankrupt and derail the progressive grassroots movement. After a five-year battle, we can now announce that the government in Washington, D.C., has just rescinded over $70,000 in fines against ANSWER for anti-war posters promoting mass protests against the Iraq war. The government started imposing these unprecedented fines after FOX News started a campaign against ANSWER around the posters. This was a huge victory and achieved after a long grueling legal battle conducted by the Washington-based Partnership for Civil Justice Fund. ANSWER has been targeted by the government’s effort to shut down grassroots organizing and leafleting. Activists were arrested on the West Coast and charged with felonies for putting up anti-war posters. In two separate instances the ANSWER volunteers were not only arrested and facing felony charges (for posters!!) but they were hit with huge bail of $20,000 and $25,000 for each of the arrested people. Again, we fought back and succeeded, thanks to the help of you and other supporters who stood with us, and with the amazing help of progressive attorneys. These victories in defense of basic free speech rights belong not only to ANSWER, but to each and every grassroots group that would suffer a similar fate if the government succeeded in repressing and bankrupting our coalition. We are entering the new year energized and ready to take on major initiatives to fight for the pressing social justice issues of our time. Please make a generous tax-deductible donation now and help us make the most out of the dollar-for-dollar matching offer from activist and educator Jane Cutter. Donors giving $50 or more by Dec. 31 will also receive a copy of Richard Becker's "Palestine, Israel and the U.S. Empire." A major priority of our work has been to support the work of March Forward!, an ANSWER-affiliated organization of Iraq and Afghanistan war veterans, active-duty soldiers and marines who are organizing fellow service members in opposition to the war and in defense of their rights and needs. March Forward! organizers are going directly to military bases and helping active-duty troops know about their rights and options to stand up against the illegal war and refuse deployment to Afghanistan. A big part of the work is to help veterans and active duty service members get assistance for PTSD and other war-related injuries. These anti-war organizers who are veterans and soldiers have become a powerful voice in the anti-war movement and they have been getting widespread media coverage, including in local media in areas where military bases are located (see www.MarchForward.org for more information). When Israel, with U.S. support, renewed its assault on Gaza, ANSWER mobilized immediately. 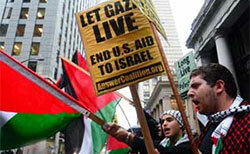 The ANSWER Coalition sponsored and helped to organize dozens of marches and rallies protesting Israeli assault. 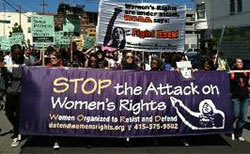 Thousands took to the streets in cities across the country, joining hundreds of thousands worldwide. In the course of Israel’s latest intense bombing campaign, Secretary Clinton, President Obama, and Republican and Democratic congressional leaders repeatedly expressed all-out support for the Israeli onslaught, while pointedly ignoring the Palestinian casualties. Over the course of a week of bombardment, at least 160 Palestinians were killed, more than 1,000 wounded and much of Gaza’s infrastructure was destroyed by a coordinated air, sea and land-based assault. ANSWER has always stood in defense of the Palestinian people, and their right to return to their homeland. As billions of U.S. tax dollars continue to flow to Israel, it is critical that people of conscience continue to speak the truth about the U.S. support for Israel’s colonial project. In October, the ANSWER Coalition joined with many other organizations in cities across the country and around the world to call for an end to war and occupation in Afghanistan. These actions marked the 11th anniversary of the U.S./NATO war. 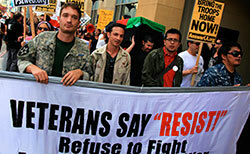 The Los Angeles march was led by anti-war veterans of the Iraq and Afghanistan conflict. In Chicago, protesters marched on the headquarters of the war profiteers at the Boeing Company, chanting “Hey Boeing, what do you say? How many kids have you killed today?” Seattle activists picketed a local recruitment station with banners that read “Afghanistan: Another war for the rich” and “Drones Kill.” In San Francisco, hundreds ended their march with a show of solidarity, joining the picket line of striking Hyatt hotel workers. Contrary to countless statements from Democratic and Republican administrations alike claiming “great progress,” etc., the occupying forces are no closer to achieving their aims than when they launched the war. In order to avoid the appearance of defeat, Washington continues to prosecute what is now the longest war in U.S. history—at a very heavy cost in blood and treasure. 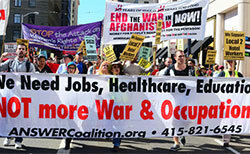 ANSWER calls for an immediate end to the occupation of Afghanistan, and with March Forward! is actively promoting the organization of anti-war soldiers and veterans. ANSWER’s mission is to link the struggles against war and imperialism abroad with the anti-racist and other progressive struggles here in the United States. Despite the election of a Black president, racism remains a central part of the country’s reality. The epidemic of police brutality in particular continues to ravage Black and Latino communities nationwide. ANSWER has stood with our community allies to mobilize against these repeated incidents of police brutality and racist violence by holding marches, rallies, and community speak-outs. ANSWER has supported the ongoing efforts of the family of Ramarley Graham, an unarmed 18-year-old who was shot and killed by the NYPD when the police rushed into his home without a warrant. On account of the family’s consistent organizing for justice, the officer who shot him has been charged with manslaughter, but protests continue. In Anaheim, ANSWER joined community marches against the local police after they killed Manuel Diaz (24). A viral video showed the police shooting with rubber bullets a crowd of mostly women and children who had gathered to protest the killing, and releasing a dog on them. Days later, the ANSWER-LA office was suspiciously raided, and all of our sound equipment and computers were stolen. In Albuquerque, the police are known for a ““kill rather than capture mentality,” which has resulted in over 15 deaths in the last few years. ANSWER has joined with community partners to help develop an organized response and expose the police culture of misconduct and corruption. In Syracuse, ANSWER continues to organize alongside the families of Raul Pinet, Jr., Chuniece Patterson and others who have been killed directly by the police or died suspiciously in police custody. These efforts have already led to new Civilian Review legislation, but the fight is far from over. As the economic crisis continues unabated for poor and working people, the 1% has been trying to strip union rights, gut the social safety net and further depress wages. ANSWER has been proud to stand with workers fighting back, in these heroic stirrings of revitalization from the U.S. labor movement. In early September, ANSWER members carried out strike support for Chicago teachers, helping to mobilize the community to overcome the city’s unsuccessful divide-and-conquer strategy. 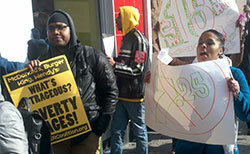 ANSWER carried the same message just a few weeks later on picket lines across New York City as 200 fast food workers, joined by hundreds of community and labor allies, struck and protested in front of their workplaces. Workers from McDonald’s, Wendy’s, Burger King, and Taco Bell, among others, united around the demands for $15 per hour and the democratic right to form a union. ANSWER volunteers mobilized in Michigan to join thousands of workers at the State Capitol against the latest attack on their rights. This year, young women organizers with ANSWER initiated a new women’s rights organization, WORD, dedicated to organizing and in-the-streets protest. The new group’s first initiative was a nationwide Day of Action on Women’s Equality Day, Aug 26, timed to coincide also with the Republican and Democratic National Conventions. WORD has quickly become an exciting network of young women organizers bringing a new energy to the fight for women’s fundamental rights. Please make a generous tax-deductible donation now to support our work, and help us make the most out of the dollar-for-dollar matching offer from activist and educator Jane Cutter. Thank you for your continued support in this critical struggle over the future of the country and the world. Many thanks to Erin Wilkerson, Ben Huff, Ben Becker and Bill Hackwell for contributing photos.